Over the past few days I have been in blues territory for WordCamp Sydney. This was my third WordCamp, after Brisbane in 2015 and Sunshine Coast earlier this year, but the first time travelling interstate. I’m very thankful to my employer Matter Solutions for sponsoring myself and several team members to attend. After landing in Sydney, there were unofficial pre-conference drinks at The Watershed Hotel. It was great to catch up with a number of old friends as well as meet some new ones in a relaxed, informal environment with a great view right on the waterfront. There were so many highlights it’s difficult to narrow it down to just a few sessions. But there were just a few moments that really stood out. 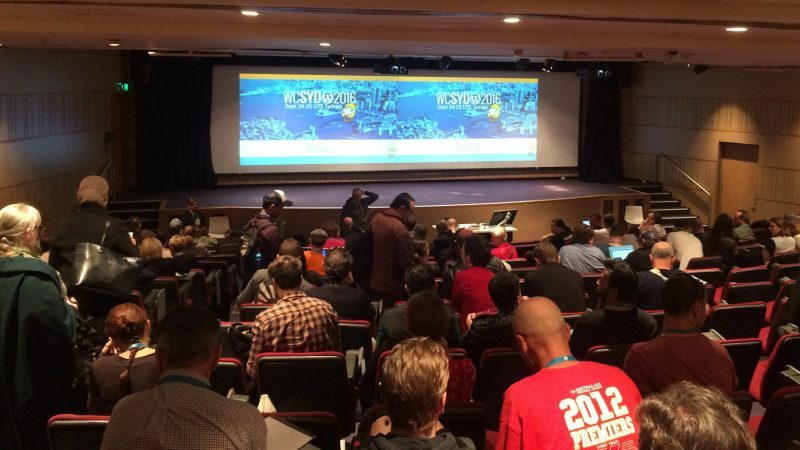 After Wil welcomed everyone to WordCamp Sydney 2016, Noel Tock prepared to start the sessions with his keynote Moving Forward In WordPress, but was slightly delayed due to some issues with the screen resolution. Several organisers and volunteers later, we were sorted and ready to begin. The traditional WordCamp after party is always a great event of networking and free drinks. However, this time there was some extra fun in that a couple of us turned up in onesies (myself included). This was an inside joke for those on the WordPress Australia Slack team, some people unfortunately chickened out but it was a great conversation starter and a lot of fun. The REST API is gaining more and more traction with each passing day and allows developers to use WordPress as a true Content Management System that is able to manage content and distribute it to many data streams such as mobile apps. Both Bronson Quick and Noel Tock from Human Made spoke about the REST API and how it will allow WordPress to continue to move forward and continue to grow. The WP REST API truly is a fantastic development and will allow websites to operate in many ways that previous weren’t possible due to the limitations of WordPress, and it’s great to see to community becoming more educated about it. As Noel from Human Made discussed how to rethink WordPress themes, he revealed that the archive widget is actually Donald Trump in disguise. The archive widget is evil, don’t use it. The team from the WP Bosses podcast were in attendance and didn’t miss the opportunity to get a number of impromptu interviews with various attendees, which were streamed live on their Facebook page. Just last month I was honoured to be a guest on the podcast, and it’s great to see them out and about supporting the Australian WordPress community. Early on Sunday morning, prior to the resumption of the presentations, the organisers of all the different WordPress meetups from around Australia (and New Zealand) gathered to collaborate, network and discuss the progression and development of the local WordPress community. If you’re interested in getting involved, sign up to the Slack team or contact your local meetup organiser (or both!). Lightning talks are very brief presentations (usually under 5 minutes) that are a little less formal than a regular presentation. While I wasn’t planning on speaking at WordCamp Sydney this year, I couldn’t resist answering the call for lightning talk speakers. My colleague Hannah and I donned our onesies once again and took to the stage to speak about culture in the workplace. There were a number of other excellent lightning talks, covering topics such as hacking with knitting, why patents rock and AI chat bots for WordPress. Above all else, it was just amazing to just spend quality time with many like-minded people. Regardless of whether attendees were developers, business owners, bloggers or more, everyone brought something unique to WordCamp. A special thanks goes out to those such as the team at Flywheel and WP Auckland who travelled internationally to make it to WordCamp Sydney 2016. Thanks again to everyone who contributed to WordCamp Sydney in any way, it was a lot of fun and I can’t wait to do it all again next year. Shout out to all the organisers, volunteers, sponsors, speakers, attendees and onesies for making #WCSyd a weekend to remember. What a fantastic post Cameron, you really summarised the WordCamp experience very eloquently, and I can honestly say that it would not have been half as fun without you and the matter solution team. Much respect for Hannah and yourself for rocking it out in the onesies, I will never attend a WordCamp without my onesie ever again.